It was made pretty obvious on my social media : I have a sick, absolutely cray-cray obsession with macarons. Okay, it could be worse. I could be addicted to all sort of illicit substances… Instead I choose the tiniest, prettiest, softest and simply most adorable dessert in this whole entire world. I won’t forget the day I tried one for the very first time. My mind switched off completely, mentality down to 10 years old. Just please, somebody, give me more of these sweet treats! This goes without saying that I could have literally finished a box of 30. The macaron is a whole culture. Born in France, it was introduced to the royal court of Versailles by the legendary gastronomy house Dalloyau and therefore from the very beginning became the delight of the “elite”. A luxurious, little handy sweet, quite complex to prepare if aiming for the perfect texture. It was then reintroduced by a house we all know in it’s current format, meaning colorful cookie and creamy center. It is light, beautiful and a very easy desert to decline in different flavors. 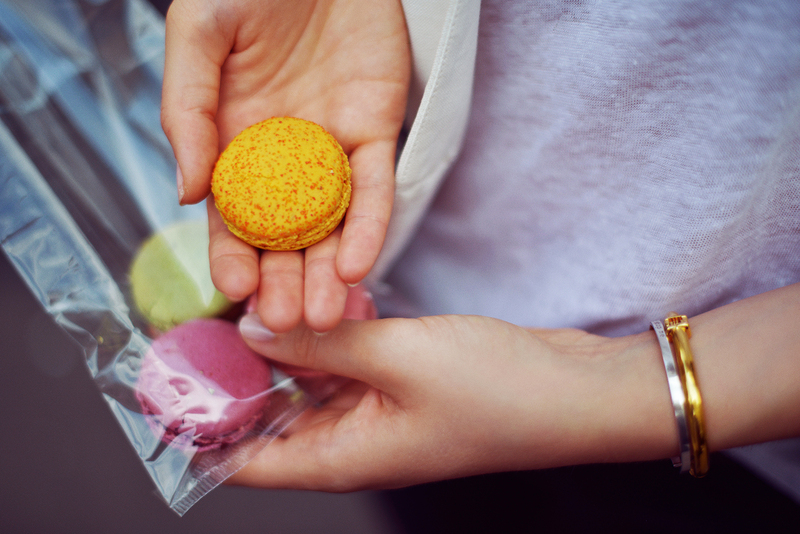 The most gorgeous, luxurious branding and packaging was created to accompany the macaron. Almost like a jewel, it came in small, pastel boxes with golden linings which were filled up, gently piece by piece. The success was immediate. The reason why I personally love it (addiction would be the word!) is because not only is it so good looking and obviously visually seducing, it is also a desert that doesn’t contain gluten! Made out of sugar, almonds and egg whites, it is a small pleasure that isn’t as heavy as a cake for example and easy for our system to digest. So delicate and refined, it’s very hard for me to resist. The little sweet faced even more massive success with the explosion of social media and the trend of sharing images of food. Let’s just say that compared to a big chocolate cake block, a little box of rainbow colored macarons gets more picture credit. From then on, people went crazy, queuing up for up to 30 minutes outside the Ladurée shops in Paris to get their hands on these small bits of mouth watering heaven. And when you pay so much and wait that long, you need your picture to look perfect. And you definitely keep the box. The more I’ve been trying macarons from different bakery shops or restaurants, the more I realized how picky I was about their quality. Discovering the ones from Ladurée set the bar extremely high. A macaron is all about softness, subtle crunchiness in the shell, airy, creamy filling within the cookie. You can go from the basic raspberry macaron with jelly or cream filling, to a lime, olive, basilic one to surprise your tastebuds! Without any further due, let’s explore some of my favorite places in Paris to indulge. We’ll speak not only about the traditional macaron but also about all the fun twists it exists in! A master of our era, Pierre Hermé started his career at the iconic house Fauchon before working at Ladurée. He invented the worldwide famous Ispahan desert (header) which is made out of two macaron shells, fresh raspberry center, rose cream filling and a litchi in it’s heart. 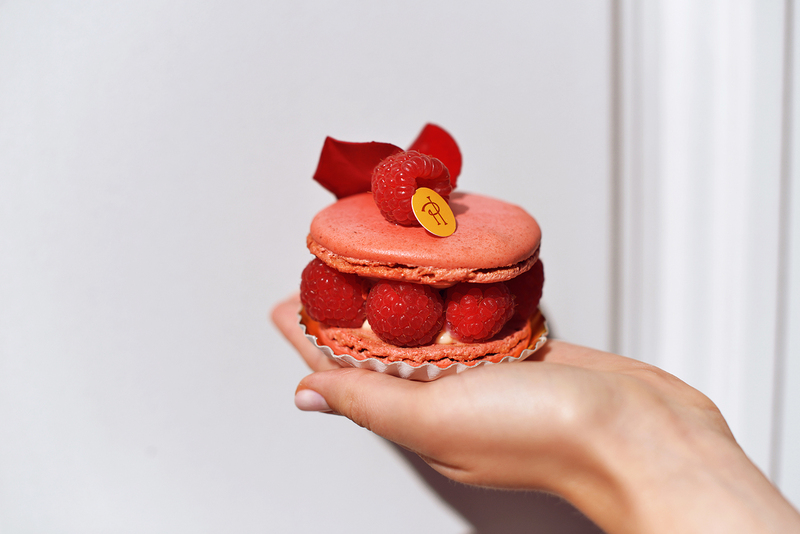 Bigger than a regular 3cm dimensioned macaron, the desert earned international success leading him to fame and to open his own patisserie house in Paris under his own name. To be able to differentiate himself from Ladurée, Pierre Herme came up with original, playful twists to the traditional macaron. More modern and experimental, he introduced surprising flavors like white chocolate and wine, rhubarb, passion fruit and even fois gras. It’s little boutique started to have queues outside and quickly became the answer for those who expected a little more originality from Ladurée or simply wanted to try something different. 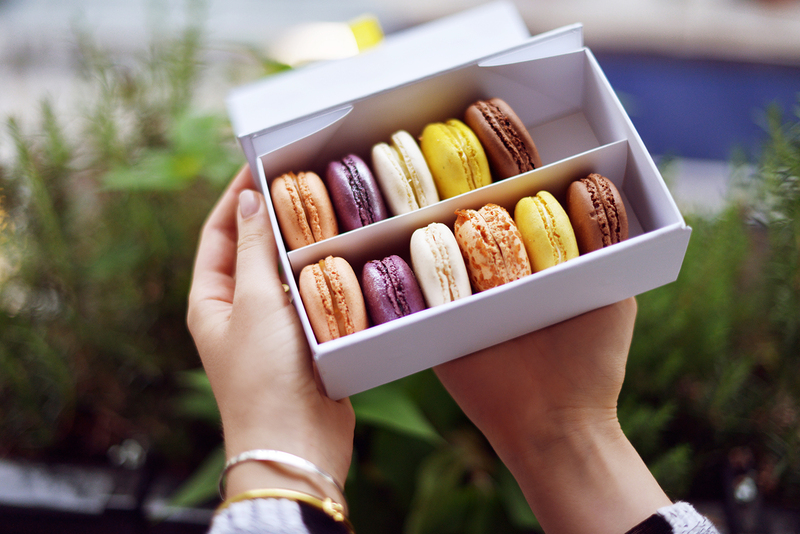 If you ask any parisian what’s the best macaron in town, they’ll usually say Pierre Hermé. Simply because Ladurée became for them almost too “mainstream”. They enjoy the flavor research of Pierre Hermé and the subtle, sophisticated interior of his shops compared to the over commercialized packagings of his competitor. I personally am obsessed with his macaron chocolat/passion and love having a macaron filled up with ice cream during summer! They come in different flavors but my favorite is pistache and raspberry. So fresh, light and playful, it’s the perfect little snack in the middle of a Parisian day while strolling through boutiques or hanging out at the park. The very first time I came to Paris because of Kayture was for a project with a beautiful parisian couture house. James and I had the chance to stay at the hotel Thoumieux that time. Ever since, we’ve been coming back religiously, loving the retro concept of this charming, luxury boutique hotel in Paris 7ème. Their chef Jean-François Piège, known worldwide for his french cuisine, hosts two restaurants within the hotel. A brasserie and a gastronomical venue for those willing to get the full, iconic experience. Attracting top tiers from all over the world, amongst his fans are several american actors (Jessica Alba being one of them) or singers, coming in for a more intimate hotel experience and top french cuisine journey. Recently, they opened their patisserie shop right in front of the hotel. An elevated, absolutely luxurious boutique with marble finishings, soft breads, perfectly shaped, glazed croissants, fresh jams for the breakfasts or caramels for gifts, the choice is vaste. I like to turn myself to the macaron corner and enjoy their classics such as vanilla, as much as a violet/cassis, one that simply tastes like a Guerlain Météorite! A must. The Angelina… Aah so many memories. It’s that kind of place that just makes my heart warm up simply thinking about. Such a magical, breath-takingly beautiful tea house (now also restaurant) in the heart of Paris that embodies perfectly the luxury, the sophistication and above all magic of a Parisian patisserie experience. Please, while in Paris, go there. Yes it’s an obbligation. I am forcing you to. Queue up for 30 minutes if needed, it’s so, so worth it. And go ahead and try their iconic “chocolat chaud à l’ancienne”. You won’t be able to drink regular hot chocolate anymore… This one is literally a chocolate soup, cooked like in the old days, that you’ll drink out of the prettiest little porcelaine Angelina cup. Their take away patisserie corner is like a little piece of paradise on earth. With chocolates, elaborated deserts, and many different little “gourmandises”, their macarons are also pretty and delicious. Now I wouldn’t say that it’s the best the house has to offer, but for those who like macarons that are a little crunchier, these ones are quite perfect. My favorite is the raspberry one with it’s juicy raspberry jam filling. The perfect stop on the famous Rue Saint Honoré, this little chocolate shop also sells macarons that definitely intrigued me when I was looking for the best ones in Paris (I’ll admit, it was just an excuse to try tons of them!). The speciality of the house though, is as you many have understood : chocolate. So if you come by, I highly suggest you to try one of their dark chocolates with jelly raspberry filling. You’ll then come back at least twice to get yourself some more. Their macarons surprised me in a very nice way. The consistency was absolutely delicious, the originality of flavors very interesting and even the appearance changed from the usual ones with the shell embellished by little colorful sugar crystals that add a little extra crackling crunch to the sweet. My favorite was the passion fruit although pistache was also absolutely delicious. Now we’ve already talked quite a lot about Ladurée and I think you figured it out : it’s a staple. It’s THE place for probably the best, traditional macaron. You can trust the house : the consistency will always, always, be absolutely perfect. The shell perfectly crunchy while soft in it’s general form. Each season, they come up with new flavors to surprise their most loyal customers. This season you can discover Mint as one of them (so good). And if you’re willing to explore the macaron culture even further, go ahead and try one of their ice cream pots topped with macaron cookie or make your home smell like a parisian bakery house with the diversity of candles they sell in their shops (my favorites are Amandine and Poudre de Riz, absolutely incredible scents). Not to mention that they also sell jams, teas, cook books and even body oils, bath salts and little accessories like bags or macaron key chains. And you definitely want to start collecting these beautiful, pastel coloured, gold detailed Ladurée macaron boxes. Looking like little jewels straight out from Versailles, they decline themselves in different colors, patterns and sizes. Again, each season, the house releases a special, limited edition box, sometimes even in collaboration with a fashion designer as a macaron is also a desert highly appreciated by the fashion crowd. The last one in date was with Nina Ricci, which resulted in a golden macaron. After a long day strolling though the galleries Printemps on the Boulevard Haussmann, a little break at the emblematic Café Pouchkine is highly appreciated. Originally driven towards a Russian tea house in the middle of busy Paris, the venue offers a luxurious, tsar-inspired desert experience with Russian pastries and flavors. Very amusing for me as I was born in Minsk, Belarus, and that all these sweets remind me so much of my childhood! But since we’re still in Paris and that the macaron is a staple in a luxury tea place like this one, they came with with their own macaron boxes, branded café Pouchkine and with the most playful and colorful mixtures. Try the “Sgychionka” one! The easiest way to explain what it is, is to compare it with liquid, lighter caramel. However, it’s actually condensed milk that’s been cooked on low temperature with brown sugar. Basically, it’s every Russian kid’s peanut butter. I grew up eating this and so a macaron with this filling is simply heaven to me. But also, don’t miss out on the Pistache/Raspberry one : it’s simply to die for. Feel free to write us YOUR recommendations! They look so nice, love macarons! Hihi love the different colors! Great post, I had the opportunity to eat when I was little but I don't remember the taste. It's look delicious! Oh I like it sooo much!!! I love macarons! They're so yummy and so worth buying because they're incredibly hard to make! Hi, just want to tell you 'thanks' for the amazing inspiration you always share with us! Now all I want is some macaroons! Such delicious looking pictures! I am in love!! Is there a website I can go to, to order some of these? They look amazing! Oh I absolutely love this post!! Thanks for sharing your reccomendations! Wow this post is stunning - your photography is beautiful!!! Oh, and the macarons look pretty great too!! I've never tried a macaron, but now I am so tempted to try. Great post, Kristina! 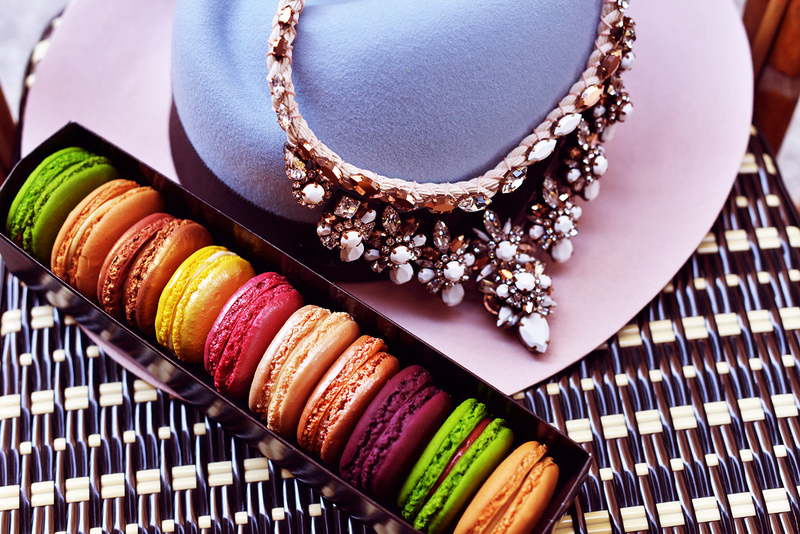 I love macarons and I love this post! Love love love your article, I feel you with the obsession of macaroons, I'm trying to find the best in Spain and I can tell you that the macaroons from enric rosich are the best I've try, there are in barcelona; when you have the chance to come to barcelona, try them. Tu avais conseillé la chocolaterie Vollenweider à Zürich et outre leurs délicieux chocolats et leurs cupcakes absoluement magiques tant par le gout que par le look, j'ai aussi beaucoup aimé leurs macarons. Magnifient of taste that i think laduree put in their macarons. But the laduree boxes are more luxury and they are very very good . I prefer classics taste as pistache chocolate or hazelnuts or rose ! Great recommentations! I absolutely love Ladurée but i have to admit that I didn't have the chance yet to try out the others! I collect the Ladurée boxes as well! The original Macaron, which is a bit smaller and white, comes from Luxembourg and is called Luxemburgerli! They then came to Zurich and THEN to France :) You can still get the real Luxemburgerli in Zurich, but unfortunately the bakery in Luxembourg that invented them closed. I love macarons like you! In my opinion Pieere Hermés are the best in the world, but I admit I have to try Thoumieux and Michel Cluizel ones. I'll do during my next travel to Paris!! I absolutely love the beautiful pictures in this post and it's lovely to see you writing a post like this. WOW. These look amazing. I have never actually tried a macaroon.. I really need to now after reading this! these photos are simply amazing! They look adorable but I've never tried one! Next time I go to Paris I'll let myself enjoy one of these little treats! Macarons actually hurt my teeth but it doesn't stop me from enjoying them. I can totally understand you addiction! I think I'm drawn to the endless possibilities of flavour combinations all in a single sweet! Love the CLASSIC sweater and the leather skirt. Where is that from? Amazing post!! Thank you for sharing! I was looking for some alternatives to the classic Ladurée!! I love macaroons too! The first time I tried it I expected a different taste, but I still love it!! They are quite photogenic too. Haha! Mmmmmmm... looks so delicious! Super nice pics! I did the exact same post while I was in Paris! Have you tried Gerard Mulot? Delicious! Pierre Hermé are the best for me ! They look so good. Cute post! I actually don't like the taste of macarons but they are soooo cute! Dear Kristina, I love your blog, not just because you're beautiful and have a great style, but because of your writing. That's why I really enjoy reading your posts. 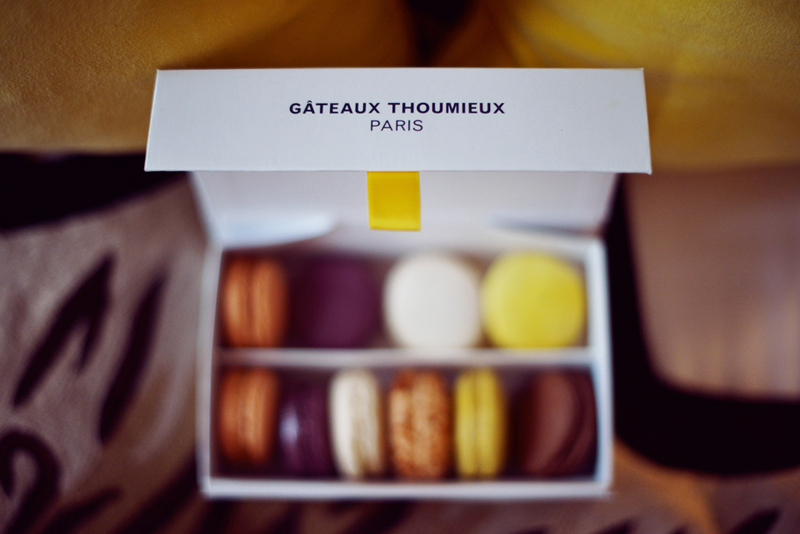 I also love macaroons, but unfortunatelly still haven't had a chance to visit Paris. So when I do go, I will try to try those you mentioned. My favourite ones are from Jean-Paul Hévin. They are amazing! I defenitely have to try them. :) Cool pictures! Mmmm delicious! Photography is also flawless as usual. Yum I wish I could go to Paris and try one! Haha, after reading this article I had a dream about macarons. OMG! They look so delicious! My mouth is watering! Such a fun and cute article. Everything looks so cute and yammi. NOMNOM. I love macarons so much but since I discovered this amazing recipe I prepare them at home! I think you said everything !! 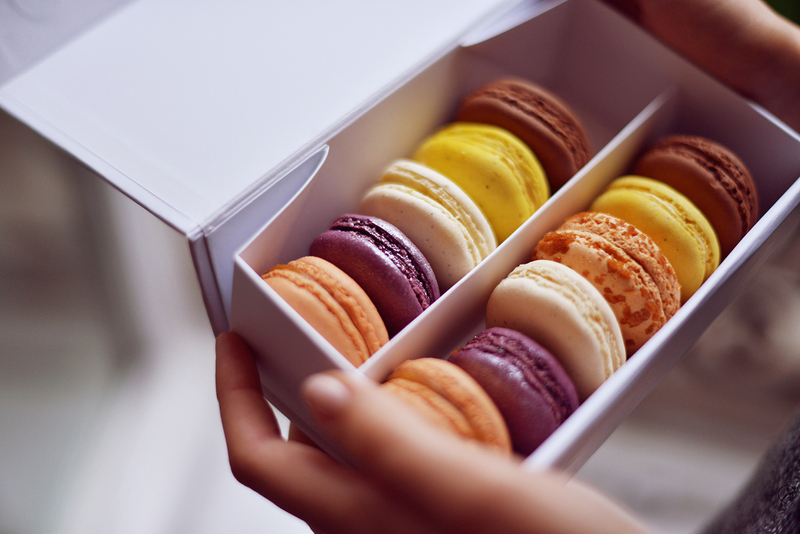 OMG make me wanna eat macarons when I read your post and it will be perfect moment ! I love your post on macrons .. Educational as well!!! You should try "Le Nôtre" macarons, to me they're the best of the entire world ! Not as sweet as the macarons of La Duree or Pierre Herme, they also have a lot of flavors, from classic ones to very original ones ! Oh Kristina, I've came to your blog to read an inocent post about fashion... and I get faced with this lovely article about macarons! It's too much of a tempation haha! I love them too as well! My favourites are the chocolate ones or the cinammon and almond ones. Too bad I live in a small town unlike Paris... there's only two places where I can buy these precious! Nice post once again. Kisses! I tried macarons for the first time a couple years ago and I instantly fell in love with them. Now they are one of my favorite treats. Plus they are healthier than other sweets. 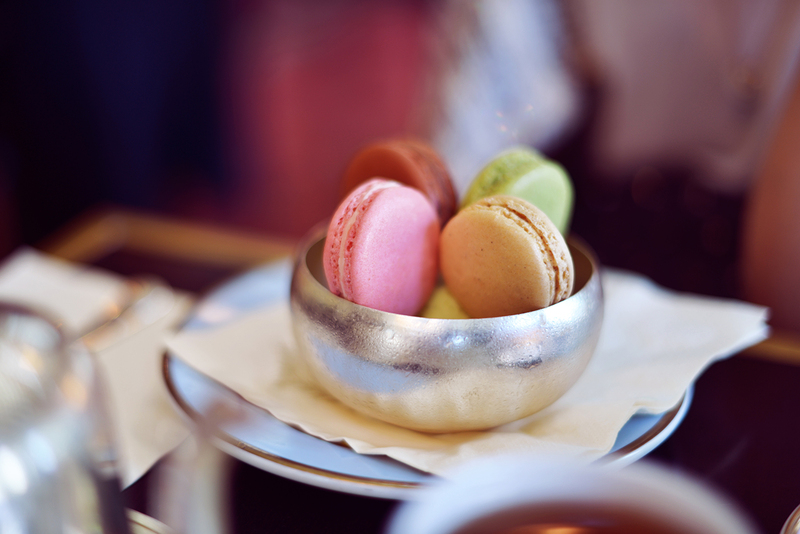 Apart from Ladurée I can also reccomend Chantal Guillon Macarons in Palo Alto, California & Moulin Chocolat in Madrid. I just got a box of luxemburgerli from Sprungli ;) can't wait to try them!! So delicious, beautiful & so cool to know they don't contain gluten!! You can't go wrong, and I am with you, sitting in The Angelina is such a wonderful experience, and eating some macarons while there is just icing on the cake! Beautifully written & perfect shots! Ahh.. what a great post! Absolutely love this post, so lovely to see a macaron post as I just got arrived home in Australia from Paris and tried nearly all of these places. Don't forget though, sometimes the small little pop up patisseries can sell the best macarons as well. But I brought so many souvenirs from Laduree it was worth it! Love the pictures! The macaroons look delicious! I just died from these sweet goodies. And woke up again to virtually eat them. YUMMMMYY! Ah !! Super article au sujet d'un petit dessert que j'affectionne aussi tout particulièrement. Ça ne fait que quelques années que j'ai découvert les macarons et j'en suis fan. Ceux de Ladurée sont pour le moment les meilleurs que j'ai pu goûter, mais je dois vraiment testé ceux à la glace de chez Pierre Hermé. Je pense qu'ils pourraient me faire fondre. Quant à Angelina. Il y en a un petit près de mon travail, je n'ai jamais testé mais suite à tes conseils il faudra que j'aille goûter leur chocolat chaud et donc aussi leurs macarons ! Et je ne manquerai pas d'essayer les autres lors de mon prochain voyage sur Paris ! Merci beaucoup pour les recommandations. What a thorough review. This is why I love your blog. You put so much into creating fabulous content! Super article! Je me rends compte qu'il me reste plein de macarons à essayer! Par exemple, je n'ai jamais goûté ceux du Café Pouchkine! Mes mes préférés sont les Ladurée. C'est cliché, mais c'est vrai! Did you eat any of these fashionable pieces? It looks so tasty:) and stunning pics! I hope to try most of these macarons on my next travel to Paris in the fall. Beautiful pics! Loved, loved, loved your discussion of French macarons! That said, dessert is misspelled all but once. I don't want to read about a desert, I want to read about dessert. Parisian is always capitalized. It's is a contraction, short for it is. Its is a possessive, it shows ownership.